Even though all the spots to get a Custom Illustration in 2013 are sold out (thanks you all! ), you can still get a picture of your children “through the Photo Cute Machine”. These are some of the latest I have done. The first one shows Thomas, a little boy who is about to turn 3 and loves the story of the Three Little Pigs, so his mom is going to turn this artwork into a birthday party invitation. 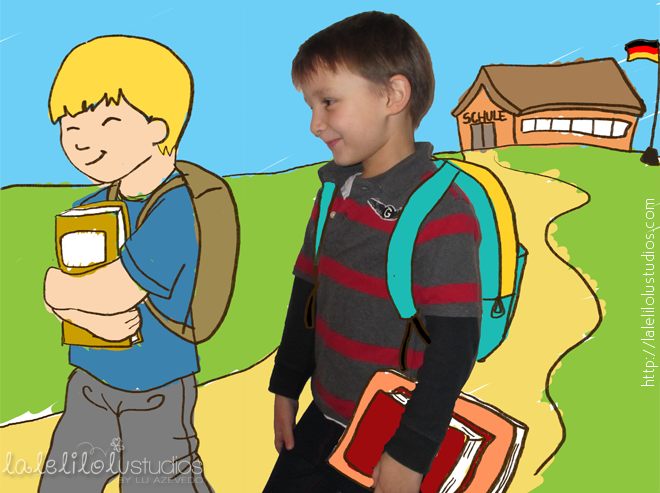 The second one, is a nice memory of this special time of Felipe’s life: the time he is finishing Kindergaten and going to school. If you want me to make some of your photos even cuter, just visit my Etsy Store or contact me HERE.